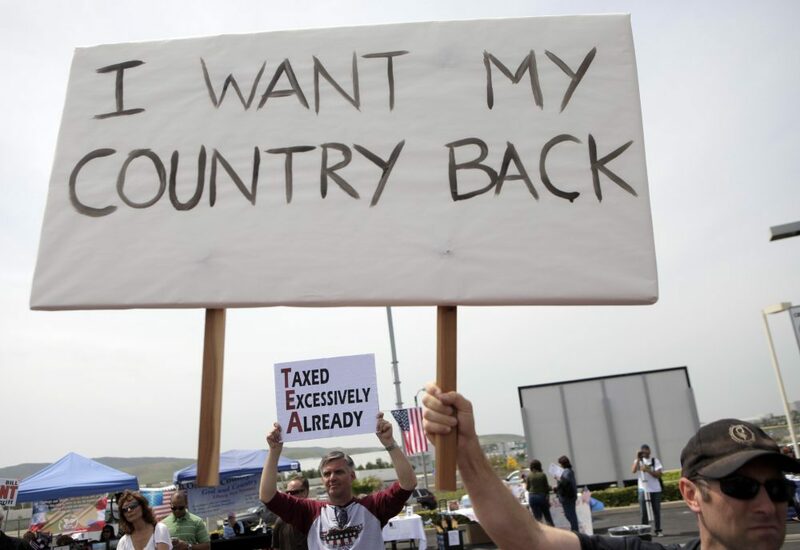 Tea Party supporters at a rally in Irvine, California, April 15, 2010. Photo courtesy of Jae C. Hong/Associated Press. Pundits nearly always attribute Donald Trump’s success to right-wing “populism.” This conclusion is dangerously misleading. Trump’s rise is rooted firmly in his ability to make an old-fashioned word—“rigged”—work in surprisingly fresh ways. Trump correctly diagnosed a feeling among working people that the system was rigged against them, and then leveraged that against his seemingly more sophisticated and better-funded opponents in both parties. That he went into the election proclaiming that it was “rigged” against him was yet another ironic flourish. As a social anthropologist who studies both “influence elites” and the workings of bureaucracy, I can help explain why this “rigging” resonates with so many regular people. I began my career in 1980s Poland studying how communist systems actually worked, as opposed to how they purported to work. In the past decade or so, I’ve experienced a nagging sense of déjà vu as people in the United States perceive a widening gap between how they expect the system to operate and how it really does. The “system” is usually taken to be a synonym for Washington but, in fact, the institutions failing the little guy go well beyond the government. Whether it’s your bank, your doctor, public school, news sources, unions, or even your place of worship, all have posted staggering declines in confidence in recent decades. Gallup’s most recent Confidence in Institutions survey shows that trust has decreased by double-digit percentages since the 1970s for 12 out of 17 institutions, including the presidency, Congress, banks, and the press. I would argue that a majority of the institutions themselves are fundamentally different than they were at the time when public trust was first measured. A bank of today is not the bank of the 1970s, when you could get a mortgage by talking to the local lending officer with whom you could meet face-to-face. He might not meet your needs, but at least he had the authority to take into account your own circumstances and history in his decision. Today, this all goes by algorithm in some unseen office. The local bank branch looks the same, but it’s now a powerless extension of a financial giant. Ditto when I have a sinus infection and need to see a specialist. While I used to be able to call the doctor’s office directly, and perhaps speak to someone I knew who could tell me if I needed to be seen or not, now I have to call a number that routes me through an incomprehensible phone tree and eventually connects me with people who themselves have little authority. While this is now bureaucracy as usual, in reality these changes have proliferated throughout our lives with lightning speed. This is the new normal, which explains why United initially barely apologized when one of its paying customers was dragged off a flight. 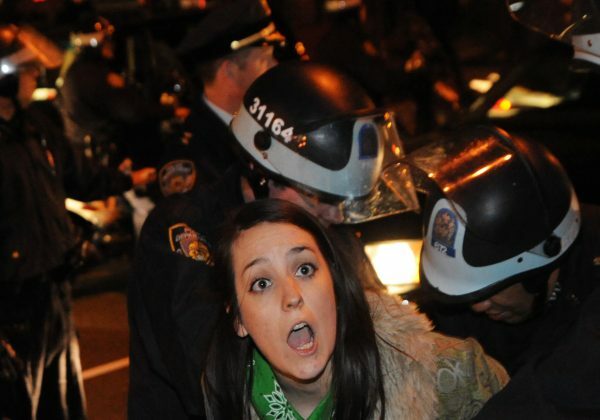 An Occupy Wall Street protester is arrested by police in New York City, Jan. 1, 2012. Photo by Stephanie Keith/Associated Press. You don’t have to spend much time punching through a phone menu to realize that no one, besides you, is incentivized to care whether you get a mortgage, heal your sinus infection, or make your flight to Louisville. And while you know you’re interacting with machines, the frustration, impersonality, and disaffection you feel feels like something I have experienced before: the daily disaffection that eventually led people under communism to revolt. Americans have recently lost a lot of power and become disconnected from community in ways that can’t entirely be explained by money or inequality. This system shows little mercy to any regular person—it’s rigged against us. And so nearly three-quarters of Americans say they think the economy is “rigged in favor of certain groups,” according to a recent poll. They are not wrong. In my research I’ve found that nearly every policy venue affecting our lives—from foreign policy to health care to the economy—has indeed been rigged to varying extents by elites shaping decisions to fit their own self-interested agendas. This trend started in the United States with the end of the Cold War, as our world was transformed by privatization and deregulation, and the ascent of digital communication. Old barriers have toppled, allowing creative elites to exercise power and influence in new and insidious ways by moving between the private and public sectors. For instance, the banking giant Goldman Sachs favored some of its powerful clients against others (including pension funds) in the notorious Abacus Deal of 2007. When the deal was discovered, only one lower-level executive was punished and the company paid a fine that paled alongside its profits. Meanwhile, so many former executives from the company have taken positions in various administrations since the Bill Clinton era that the company is jokingly called “Government Sachs.” And while that seems to be a joke about the company, in the heartland it stings because it’s also about a government that—like so much else—doesn’t work as it should for ordinary people. For those of us watching these generals on TV, the question of where public interest stops and private interest picks up looks dangerously blurry. The public has no way to know whether a general’s analysis is driven by genuine national security concerns or by a desire to build his brand and expand business for a powerful contractor. In these transactions, the public not only foots the bill, but also loses perhaps the most crucial resource a democracy has: trust. You don’t have to spend much time punching through a phone menu to realize that no one, besides you, is incentivized to care if you get a mortgage, heal your sinus infection, or make your flight to Louisville. I call this the “new corruption”—corruption that is systemic and legal, and yet violates public trust. This is not the old corruption of simple fraud, or a bribe taker stuffing cash in the freezer. Practitioners of the new corruption assume a tangle of roles that fuse state and private interests. They hone their political influencing through means that are several steps removed from direct power and difficult to detect. Many are “shadow lobbyists,” such as, say, an economist from a prestigious university who testifies before Congressional bodies and the media using his professor label while he really is shilling for the investment bank for which he consults. The number of registered lobbyists declined by 24.5 percent from 2007 to 2016, according to the Center for Responsive Politics. It is unlikely that this drop means a decline in lobbying per se. Rather, it appears that influencers are eschewing registration, swelling the ranks of shadow lobbyists. The sense of pervasive rigging explains the groundswell of distrust that helped bring President Trump to power last fall. His constant references to Hillary Clinton’s private email server and problematic family foundation resonated with many voters. Unlike Clinton and most of his Republican opponents in the primary, candidate Trump was not a member of any policy-shaping elite of consequence. Rather, he built a brand—with a canny combination of TV and Twitter—as an authentic anti-establishment figure who acknowledged his listeners’ disaffection and granted them a sense of power through his performances. With an ever-broadening gap between the myth and the lived realty, it was no surprise that the Tea Party and Occupy Wall Street—at two opposite ends of the political spectrum—sprang up in the years after the 2008 financial crisis, when it became undeniable that the system was working for a select few and not the rest of us. An enraged populace has been knocking on the door of the system, trying to get in, and can’t. Ironically, while so many looked to him as a system-busting “outsider,” the Trump administration is poised to further widen the gulf between lived experience and people’s expectations for democracy. Having named the problem—“rigging”—Trump now finds himself tangled and trapped in it. In a mere 100-plus days, he has brought the very rigging he has railed against to a new level of blatancy: from Ivanka Trump using her position to promote her fashion line, to packing his cabinet with bankers and billionaires with financial conflicts—all while starving parts of the bureaucracy through unfilled positions and budget cuts. After a decade or two of this informal system of influence and rule-bending in the shadows, with the new administration it now has come out into the open. In dismantling and reorganizing governance, Trump is borrowing from the communist playbook: power and personality frequently trump process, formal position, bureaucracy, and elected bodies. He has tried, so far with incomplete success, to enfeeble pillars of democracy: civil liberties, a free press, an independent judiciary. When your democracy doesn’t feel like a democracy, the system demands overhaul. Starving it or busting it entirely will only lead to more distrust. Public institutions need remaking; they need to re-deliver. That may be the only true way to narrow the gap between what should be and what now is. And those elite influencers? They must be brought to account, and then made to rebuild the system they’ve helped break. Janine R. Wedel is University Professor in the Schar School of Policy and Government at George Mason University and the author of Unaccountable: How the Establishment Corrupted our Finances, Freedom and Politics and Created an Outsider Class.